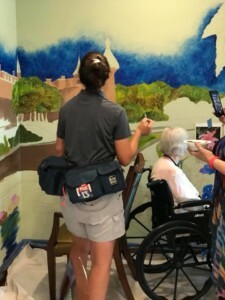 “An assisted living facility in Hillsborough County is exploring the possibility of painting as a way to help patients suffering from memory loss. Residents at Tessera of Brandon helped paint a mural of the historic Henry B. Plant Museum at the University of Tampa. The residents worked under the watchful eyes of a professional art instructor and memory care specialists at the facility. Memory care specialists are using the art project to help the residents remember the feelings that creating art gives them. In the future, residents will be able to walk by the completed mural and hopefully remember the fun they had contributing to it.